In 2019, Chicago is electing its local government, through a General Election on February 26th and a Runoff Election (as needed) on April 2nd. Use this guide to learn more about the upcoming elections and how you can participate. How Do I Register & Vote? How Can I Make an Informed Decision? What’s On My Ballot? How Do I Decide? Chicago City Government is comprised of the Mayor, City Clerk, City Treasurer, and 50 Aldermen. 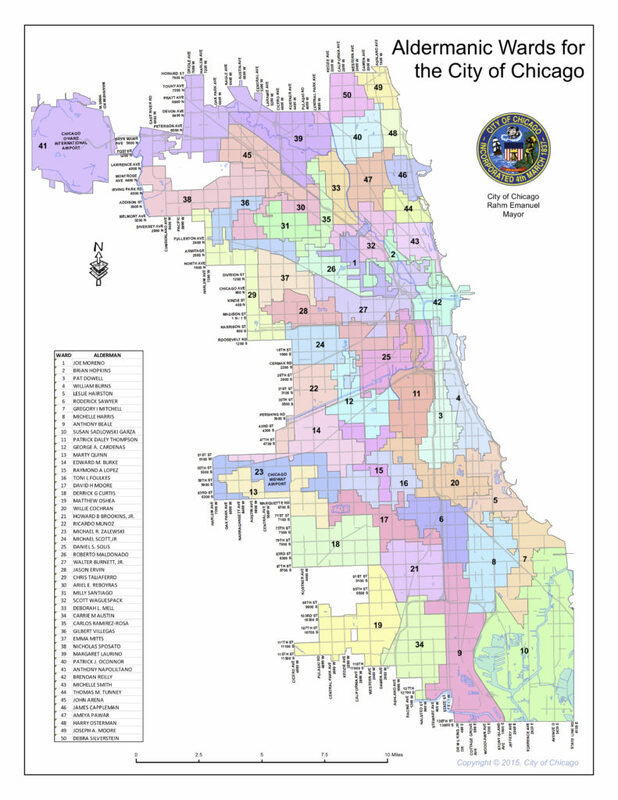 Each Alderman represents a municipal legislative district (called a ward) in the City Council. The Mayor, City Clerk, City Treasurer, and Aldermen are elected on a non-partisan basis to serve four-year terms. Learn more about what each office does. For each office, if no candidate receives a majority (at least 50%) of the votes cast in the general election, a run-off election is held between the top two candidates. Note that April 2nd is also the date of the Cook County Consolidated Elections, so Evanston will also be electing several local officials on this date, primarily school board members. Learn more about offices and candidates and how to register and vote in the Evanston election. Who can vote in the Chicago Municipal Elections? You can vote in the Chicago Municipal Elections if you are registered to vote at a Chicago address. Do I have to be registered as a Democrat or a Republican? No. Chicago Municipal Elections are non-partisan. You can check your registration status online through vote.org, or for Chicago specifically, with the Chicago Voter Information Search Tool. What if my election authority says I’m not registered? If you registered recently, it often takes several weeks for registration requests to be processed. If your record cannot be located, or you have concerns about your registration, contact the Chicago Board of Elections at cboe@chicagoelections.net or (312)269-7900. If you run into a problem, don’t panic – you still have the option to register and vote through Election Day. How can I register to vote or update my registration with my current address? By Mail: Register to vote via mail-in form by January 29th for the General Election or March 5th for the Runoff Election. Come to CCE if you need help printing or mailing. Online: Register to vote via online form by February 10th for the General Election or March 17th for the Runoff Election. Note online voter registration requires an Illinois drivers license or state ID. In Person: If you have passed these deadlines, it is not too late! Register and vote at the same time at any Early Voting site, or at your designated local polling place on Election Day. No. If you haven’t registered yet, it is not too late! You can still register and vote at the same time at any Early Voting site, or at your designated local polling place on Election Day. To register to vote, you must present TWO forms of ID. You should be prepared to cast your ballot immediately after registering. Something that shows your current address: A lease or rental contract, a utility bill, a bank or credit card statement, a pay stub, a medical or insurance bill, a school transcript or tuition bill, a vehicle registration or insurance card, etc. I am currently registered at my campus address in Evanston. Can I change my registration to my permanent address in Chicago? Yes. College students have a legal right to register and vote at either their permanent address or their campus address. Where do I vote? Where is my polling place? When are the polls open? You have the option to either early vote or vote on Election Day. To vote on Election Day (General Election: February 26th or Runoff Election: April 2nd), you must go to your assigned polling place. To find your polling place, use the Voter Information Search Tool. On Election Day, all polling places are open from 6 AM to 7 PM. Yes. Early voting allows you to avoid lines at the polls on Election Day by casting your ballot ahead of time, at a time that is convenient for you. You can register to vote on all early voting days, however, you must present TWO forms of ID to do so, and you should be prepared to cast your ballot immediately after registering. If you are already registered to vote in Chicago, you have the option to Vote by Mail. You must request a Vote by Mail Ballot by February 21st for the General Election or March 28th for the Runoff Election, though you are encouraged to apply as early as possible to make sure you receive your ballot on time. You will be mailed a paper ballot to complete, sign, and mail or deliver back. Your ballot must be postmarked by Election Day. Stop by CCE if you need help returning your Vote by Mail ballot. If you have requested a Vote by Mail Ballot but have not yet received one, contact the Chicago Board of Elections at cboe@chicagoelections.net or (312)269-7900 to check on the status of your ballot application. If you encounter further issues, consider voting in person – you still have the option to either early vote or vote on Election Day. What do I need to bring to vote? What can I take with me into the voting booth? If you registered to vote by mail, and are voting for the first time at your current registration address, you may be required to show ID (including a current photo ID and proof of residence) to vote. Otherwise, in Illinois, you are NOT required to show ID to vote. However, we recommend bringing a Wildcard or other photo ID just in case. You are allowed to bring notes or sample ballots with you to the voting booth and to look up information on your phone. However, in Illinois, you may NOT take any photos of your ballot or inside the polling place. What if I don’t have my Voter Registration Card? You do NOT need your Voter Registration Card to vote. However, you must be registered. Make sure to verify your registration status online at vote.org, or for Chicago specifically, with the Chicago Voter Information Search Tool. If you run into a problem, don’t panic – you still have the option to register and vote in Illinois through Election Day. The General Election Ballot will allow you to select a single candidate for each office: Mayor, City Clerk, City Treasurer, and your ward’s Alderman. Depending on your ward, there may be one or more referenda, or opinion questions about proposed changes to local laws, including questions on rent control, marijuana revenues, and community benefits agreements around the Obama Center and the El Paseo Trail. In the Runoff Election, an office will only appear on the ballot if no candidate receives a majority (at least 50%) of the votes cast in the general election; in that case, the top two candidates for that office will appear on the ballot. To view a sample ballot, use the Chicago Voter Information Search Tool. You can also use a resource like BallotReady, Ballotpedia, or Vote411 to view your sample ballot and research detailed, nonpartisan information on candidate profiles and positions at the same time. Use a resource like BallotReady, Ballotpedia, or Vote411 to research detailed, nonpartisan information on each candidate’s profiles and positions. You may also wish to review candidates’ websites and candidate questionnaires, read local news articles, and attend or view candidate debates and forums before voting. Consider candidate questionnaires and editorial board endorsements by local news media. Also check whether local political or advocacy organizations you are aware of or involved with have made endorsements. Chicago Sun-Times Voter Guide: Candidate profiles and responses to questions on key issues for each race, plus links to candidates’ campaign websites and social media pages, election news, and editorial board endorsements. WTTW Voter Guide: Candidate profiles, responses to questions on key issues, and brief video statements from candidates for each race, plus an at-a-glance guide to where Mayoral candidates stand on key issues and videos of candidate forums. Ballotpedia Voter Guides for Mayor, City Clerk & Treasurer and Aldermen: Candidate profiles, summary of key issues in each race and candidates’ position on those issues, plus campaign finance data, polling data, and endorsements. See more in Sources & Additional Resources below. Do I have to vote for every office on the ballot? No! If you don’t feel sufficiently informed about a particular office, set of candidates, or issue, you can choose to leave that category blank. This does not invalidate your ballot – your other selections will still be counted. Consider volunteering for a candidate’s campaign (visit your preferred candidate’s website to learn more) or working as an Election Judge at a polling place on Election Day. If you have additional questions about registration or voting, contact the Chicago Board of Elections at cboe@chicagoelections.net or (312)269-7900. You can also stop by the Center for Civic Engagement (1813 Hinman Ave), tweet @NUVotes, Facebook message NU Votes, or email nuvotes@northwestern.edu, and we will do our best to assist you. Be A Part of Northwestern's Voting Culture. Please note: The information here was compiled from publicly available sources in an effort to help provide students with non-partisan information that they may need to know in order to register correctly and vote in upcoming elections. Northwestern University does not endorse or oppose any candidate or organization in connection with this or any other political campaign or election. Students are responsible for working with their own local election officials to ensure their own correct registration and to verify local laws and policies about voting in their respective districts.